The current "Interface" exhibition in our Bethesda gallery has really been drawing a diverse and constant flow of visitors, including several schools who have come in groups to see the show. And Claire Watkins amazing magnetism-based kinetic sculptures have really been drawing the "oohs" and "aaahs" from nearly everyone. Watkins is a recent graduate of VCU's highly acclaimed postgraduate sculptural program, ranked number one in the nation (I am told). 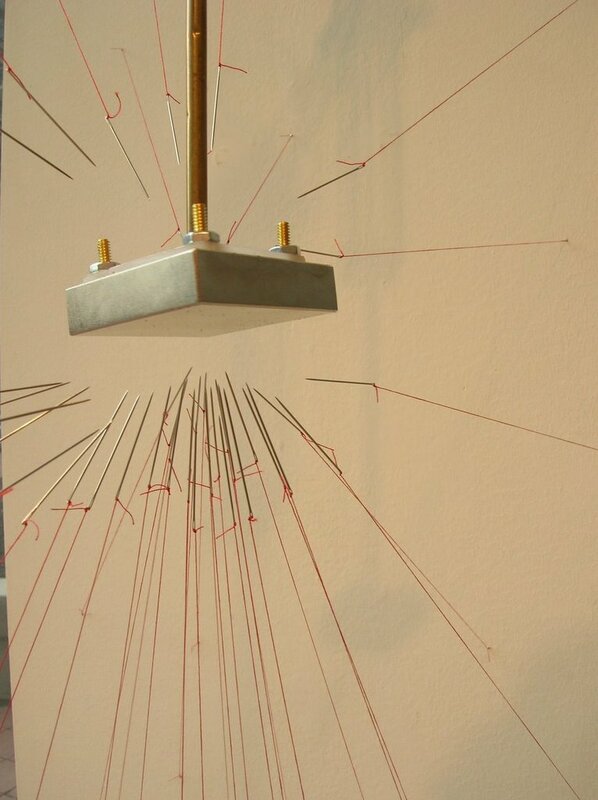 The hypnotizing sculpture of the rotating magnet, hanging from a plastic, clear bracket and attracting a set of ever moving, dancing needles has clearly become the star attraction of the exhibit. To me, the interesting thing about this sculpture is the fact that it will never be the same once de-installed and re-installed in whatever collector's home it ends up in (it's still available for sale by the way). When the sculpture sells, Watkins will have to go to the collector's home and install the work in a chosen area. I suspect this will be a placement chosen by both artist and buyer, and brings some interesting questions to the whole classification of the piece. For example, a smart thing for the collector to do, is the video the whole installation event, as I found it fascinating to see Watkins weave the installation of the sculpture in the gallery's corner space. It would be particularly interesting to see her re-create that, in a different space (someone's home) once the piece sells. On the gallery’s main wall, her other three sculptural arrangements hang: two triptychs and a diptych. They are ink and acrylic etchings on a copper plate, floating away from the wall, projected from a plastic armature that hides a small motor. The hidden motor rotates a small magnet, and this magnet, in turn, causes pins and iron filings to dance and move on the surface of the etchings. 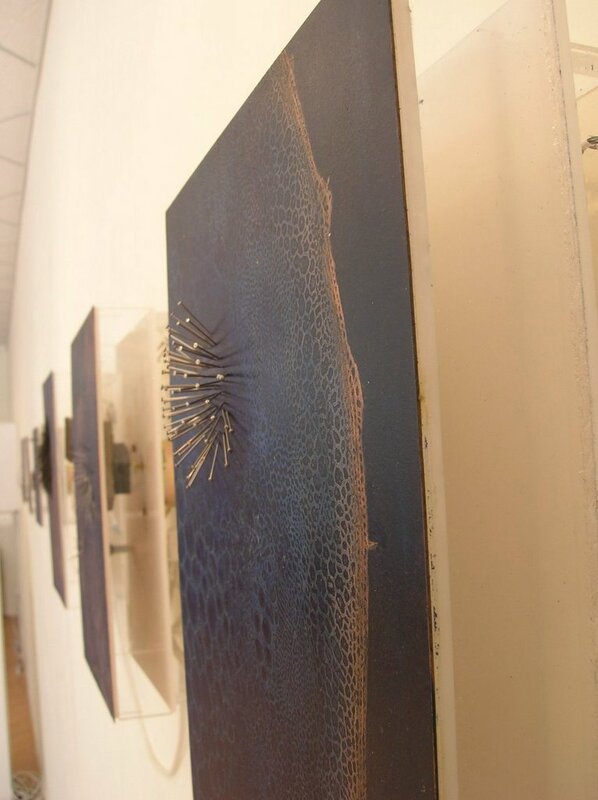 And the interesting thing that I've noticed over the days since she installed the pieces, is that the metal filings, pins and other metallic objects that dance and move on the surface of the etchings... ah... move! So it seems that the movement is not only driven by the rotating magnet behind it, but also by the ever changing magnetic fields of the Earth itself. What does this mean? It means that these sculptures are never, ever quite the same at any given second; they're always evolving and changing and moving. One day the filings have climbed atop pins and radiate outwards; a few days later a lonely pin has drifted away from the pack, and so on. Watkins, who now lives in New York City, is currently speaking with several New York galleries and I am sure that we will continue to hear great things about this talented young artist. "Interface" runs through February 8, 2006. Conner Contemporary Art is damned pleased to introduce the work of Fatima Hoang, Michael Magnan, Maki Maruyama, Annie Schap, Zach Storm and Matthew Sutton in Whippersnappers – an exhibition of young, bright, culturally astute artists who, in their opinion, rock. There will be an opening night reception at Conner Contemporary Art on Friday, February 3rd from 6-8pm, and the show runs through March 11. Cows, Pandas, Elephants, Crabs, Apples, Mermaids, Testudos and now doors! "Making an Entrance" offers an opportunity for artists to create artistic doors. Details here and the prospectus here. Adrianne Mills and company had a load of fun painting some bodies last weekend at the Anne C. Fisher Gallery in Georgetown. See loads of images here. By the way, the person getting painted is the very talented artist Michal Hunter. There's still time to catch "Bodies of Work" at the gallery, and see some of Mills' intelligent photography on this sensual subject. The show runs through Feb. 11, 2006. A rare mini review by the WaPo's Chief Art Critic of a Washington, DC gallery show. Read Gopnik's mini review of Dean Kessman at Conner here. Read this WaPo review of a recent book on the above subject. More on this later. Provides grants and free technical assistance to local arts agencies partnered with health organizations to establish or enhance existing arts and healing programs. Programs may range from artist residencies, exhibits, concerts and bed-side crafts activities in hospitals to artists working with visiting nurses, hospice and nursing homes. The College Art Association assists artists financially in completion of MFA and Ph.D. programs. Grants of up to $5,000 are awarded to individual artists. Mark Jenkins sent me this street performance link for Improv Everywhere. It's called "Suicide Jumper."